Parked outside the Croaky Frog Café in Batley the cut-up bus is causing a bit of a stir. “Do you fancy coming to one of our performances?” asks Creative Scene’s Nancy to the older woman pushing her dog along on a stroller. 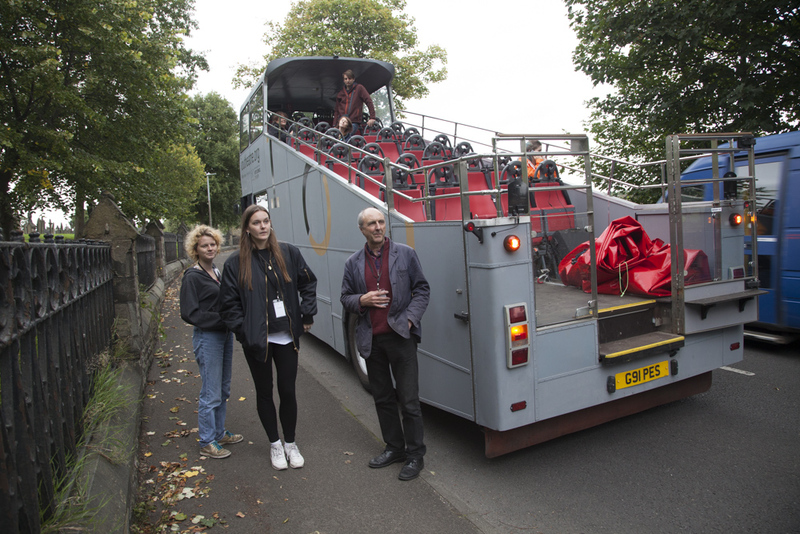 The highlight at this weekend’s Batley Festival will be IOU Theatre’s immersive bus tour where the 40-strong audience sit facing out the back of this mid-engined Volvo B10M as they follow a 70-minute performance around town. 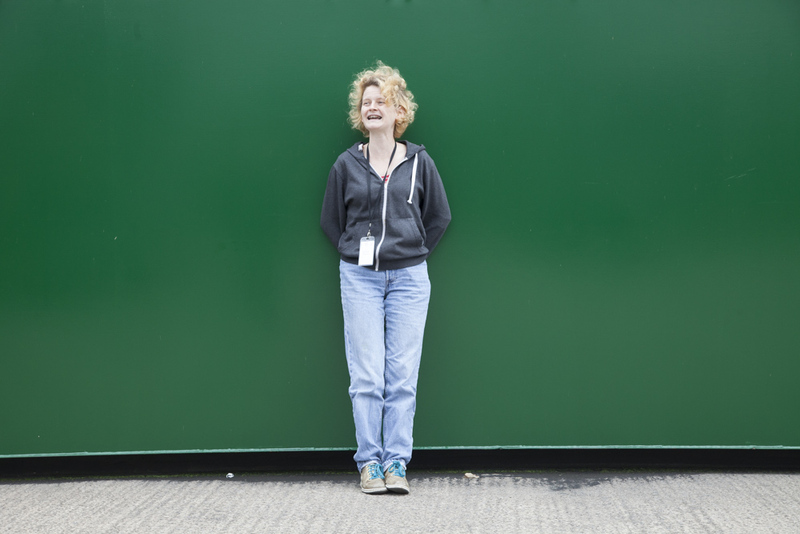 I first heard about the half-bus, half-auditorium back in November when the Halifax-based arts group pitched their idea to Kimberley Thirkill, chair of the Festival. She liked it, obviously. And, judging by the tour dates for Rear View, lots of other people liked it too. 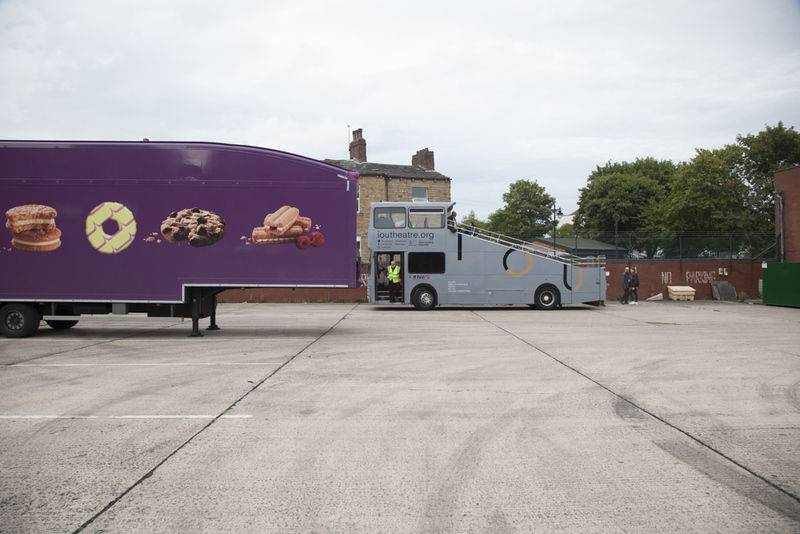 As well as being co-commissioned by Creative Scene the bus has already performed at Norwich, Greenwich and Blackpool this summer with Great Yarmouth and Redcar still to come. “Everyone back on the bus,” calls IOU’s artistic director, David Wheeler. Minutes later we’re driving down Commercial Street waving to bewildered pedestrians as if we’re on The Mall. This is a rehearsal run but it might as well be a publicity tour. We’re definitely turning heads. The bus seats look unremarkable but, as technical manager Dan Powers points out, “underneath each is a bunch of sophisticated microelectronics that allows each audience member to be totally immersed in the show through their headphones. And, for anyone with visual impairments, we can direct a bespoke audio description to their individual headset.” Clever. “Ah, lovely,” I say, nose in the air, as we turn into the sweet-smelling Fox’s Biscuits compound. 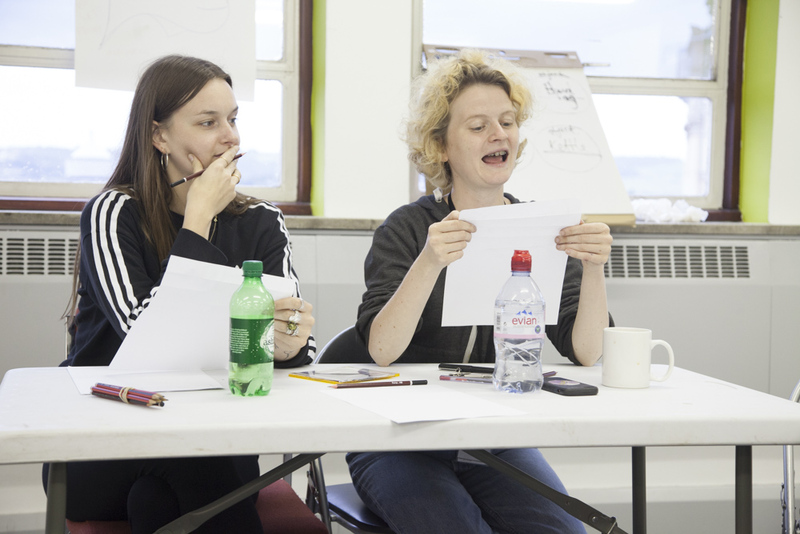 Performance poets Cecilia Knapp and Jemima Foxtrot are already here. Once we’re parked up David gently directs each of them as they take turns on top of an external staircase. “Maybe stay up there for a while longer,” he says to Jemima as she begins her lines. “And in each town you’ve tweaked the script to include elements of that place?” I ask. 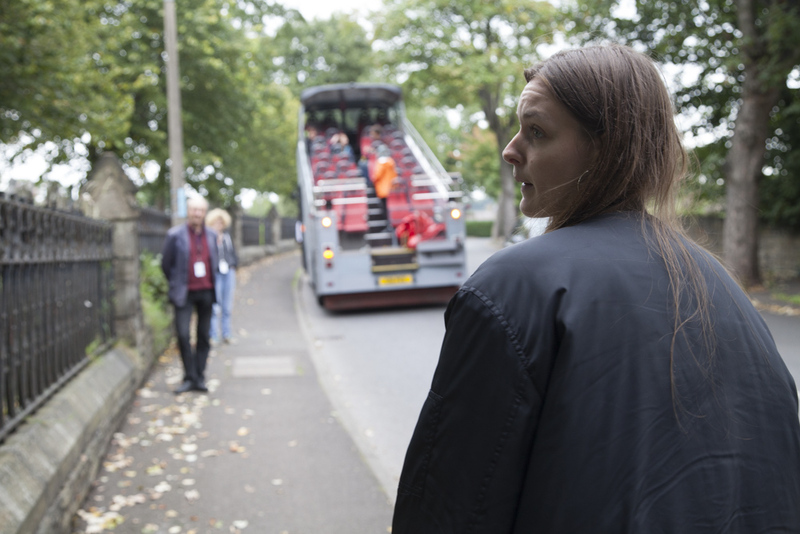 Back on the bus we head for the final stop, alongside Batley cemetery where Cecilia rehearses her monologue. A woman passing by looks back at the bus and breaks into a scurry in the opposite direction when she realises she’s in the middle of something big. She is. Three hours later we are in Empire House, opposite Dewsbury Town Hall. 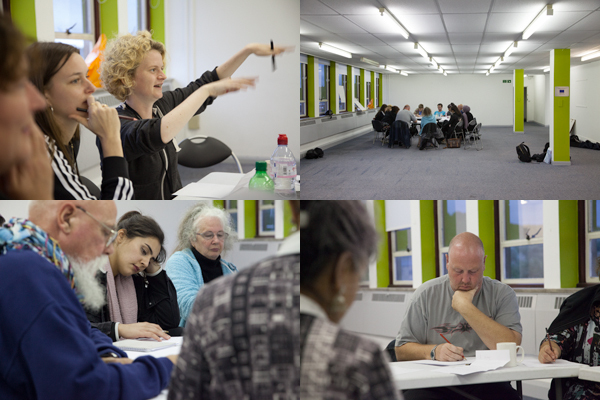 This evening Cecilia and Jemima are leading a creative writing workshop for local writers and poets who’ve been attending Creative Scene’s spoken word events. After some warm-up exercises – including thinking up adjectives to describe a fish – we all get stuck in writing a piece about a place where we are happy. Heads down, scribbling, we have no difficulty in getting something on paper and there’s no shortage of volunteers to share their efforts. “I loved your piece,” I say to Jason afterwards, who produced a seemingly effortless recollection of going out to play as a lad. Rear View will be at Batley Festival, Friday 8th-Sunday 10th September. Book tickets here.